The facility will tackle barriers that keep people in poverty. The Salvation Army recently opened its new Bayview Impact Center (BIC) facility in the Bayview neighborhood of San Francisco—one of the city’s poorest areas. The center will provide comprehensive case management services to help clients overcome obstacles that are keeping them in poverty. 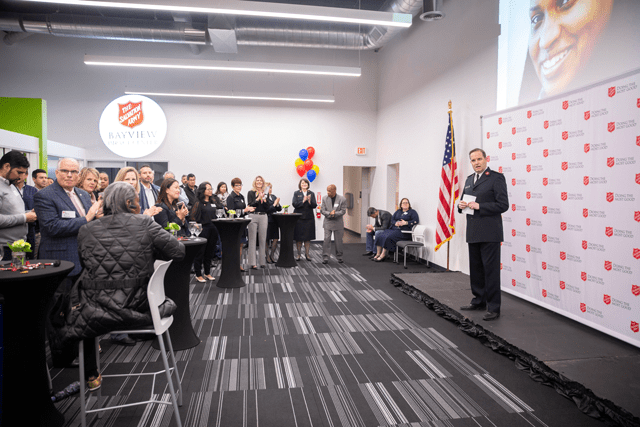 Salvation Army Golden State Divisional Commander Major Darren Norton addresses the crowd at the Bayview Impact Center dedication ceremony Feb. 27. Previously, The Salvation Army leased a smaller building in the neighborhood for the BIC to offer case management services. The Salvation Army purchased the new facility building and completely remodeled it. 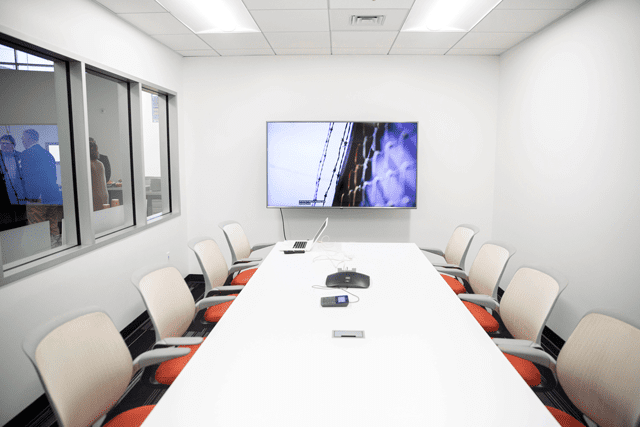 It now features an open area desk space for staff to work with clients, private counseling rooms to conduct client intake interviews, a board room and more. Bayview Impact Center dedication ceremony attendees talk to one another and check out the new building. After clients come in for initial assistance at the new center, BIC staffers interview them to determine what is keeping them from escaping the cycle of poverty. Then, they help them set up a plan to tackle these obstacles, including setting up email accounts; acquiring identification documents such as driver’s licenses, Social Security cards and birth certificates; help in applying for state and federal benefits and assistance; and making sure clients have access to medical services. “We’re really trying to be there for people in their entirety,” said Trey Hiller, BIC community coordinator. After this is taken care of, they move on to resolving issues in clients’ pasts—financially and legally. Clients learn how to set up online accounts to access credit and banking reports, Internal Revenue Service tax and wage transcripts, child support cases and more. The center’s caseworkers specialize in financial rehabilitation, refinancing and payment plans, so they can help clients come up with a plan to take back control of their finances. The new building includes a boardroom. Employment assistance is also a key aspect of the center. Clients receive General Education Development and High School Equivalency test preparation, resume and cover letter training, mock job interviews, career planning and development guidance, and education on online employment resources such as LinkedIn, Monster and Indeed. BIC also has a partnership with Swinerton, a local construction company, to connect people with workforce development opportunities. “We really want to get people employed because we feel that is a vital thing for independent living,” Hiller said. The new Bayview Impact Center facility features private counseling rooms for staff to meet with clients. Additionally, caseworkers work with clients to conduct court searches for the status of civil and criminal cases they may have, acquire arrest records, explore avenues for getting records expunged and getting back on track with their probation officers. “A lot of times for people who have been incarcerated or have been in the criminal justice system there’s an enormous amount of fear and challenge in addressing that part of your past and they oftentimes have no idea…where they stand,” Hiller said. A referral service with attorneys is in place at the BIC to provide legal aid for each case that requires it. The BIC is also conducting a pilot virtual reality (VR) program with Salvation Army San Francisco Adult Rehabilitation Center beneficiaries for meditation and art therapy. A VR session consists of two meditations of three to four minutes. “The goal in this is to help people calm and focus their minds,” Hiller said. Ultimately, Norton longs to see the BIC model expand across the Golden State Division.